(From company literature) KENKO TELEPLUS HD DGX 1.4x is a Tele converter designed to make images more impressive by turning your master lens into a Tele lens and capturing the object more close. By installing it between the lens and the camera body, KENKO TELEPLUS HD DGX 1.4x increases the effective focal length of your lens by 1.4x. Precisely made in Japan and compatible with a wide range of genuine cameras and lenses, it is particularly helpful for those professional photographers as well as amateurs who may need a Tele lens but feel no reason to purchase a new expensive one due to low frequency of use. An optional accessory to bring your photos on a new level of creativity in the most convenient way. 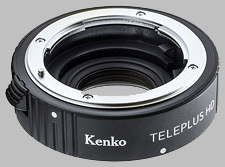 Kenko Teleplus tele converter 1.4x is a high precision manufactured optical device to be installed between the camera body and the master lens. Its purpose is to multiply the focal length of the lens according to its multiplication factor, changing your lens into a tele lens, with minimum loss of resolution and sharpness of the image. For example, an 1.4x Tele converter can turn a 70-200mm lens into a 98-280mm lens. The Kenko HD DGX is a standard series of tele converters designed to fit high-resolution DSLR cameras and lenses, and to perform best results when used with lenses whose focal length is from 50mm or more. High quality optical elements, as well as other parts, due to its precise manufacturing in Japan. Compatibility with a wider range of Nikon and Canon lenses, marking it as the most versatile accessory among those usually chosen by photographers. Other manufacturers' lens and camera models are not supported. The Kenko 1.4X Teleplus HD DGX doesn't have any user reviews yet!